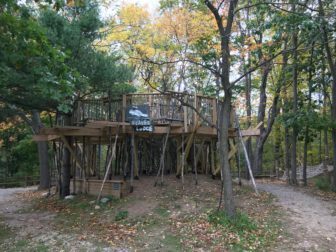 The sound of leaves crunching under your feet, the Red Cedar River flowing right beside you and birds chirping: The sounds and sights of nature are an experience, the Harris Nature Center staff is hoping all visitors can have. The center is tucked away in the woods lining Van Atta Road and is just off the bank of the Red Cedar. First opening its doors in 1997, the center has proclaimed itself as a place for recreation and education. The park is open from dawn to dusk and everyone is welcome. Visitors can do what they want, walk, jog and even ride bikes. It’s all about exploring on your own, said Rich. While exploring on your own is encouraged, the center also offers various programs to educate and connect with the community. According to Rich, the center welcomes school groups and works in tandem with the teachers to create programs that coordinate with their curriculum. Harris also hosts programs for community members of all ages. 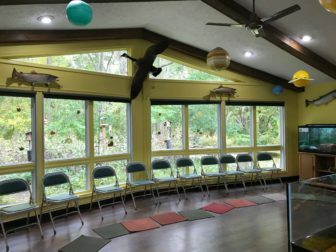 Working with schools is a big part of what Harris Nature Center does, it put a lot of importance on teaching about the environment and local ecosystem. The Harris Nature Center is located at 3998 Van Atta Road. and is open 9 a.m. to 4 p.m Monday through Saturday and 12 p.m. to 4 p.m. on Sunday’s. The park is open visitors from dawn till dusk.